Shop with the Davis' Big and Tall coupon code for men's clothing from one of the oldest tall & big apparel stores in the country, family owned and operated since 1902. Get Free Shipping on your order of $79 or more to anywhere in the lower 48 states. 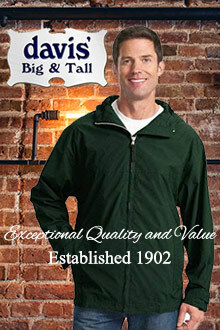 Savings will automatically be applied at checkout on the Davis' Big and Tall website.